Eye Exam Office inside the Santa Rosa Costco | Bradley I. Hall, O.D., P.C. Bradley I Hall, OD, PC is the independent eye exam office inside the Santa Rosa Costco. We provide friendly, professional and thorough eye exams for patients needing eyeglasses, contact lenses, LASIK and help with a variety of eye health issues. Initial Interview: We ask you questions about your eyes, vision, current eyeglasses and/or contact lenses, medications and overall health. Your answers can help us determine how to best help you with your individual needs. Visual Acuity: Your vision without correction is measured. Lensometry: We measure the prescription in your current eyeglasses. AutoRefractor / AutoKeratometer: This machine estimates your eyeglass prescription, measures the curvature of your eyes to help with possible contact lens fittings and determines the distance between your pupils. Refraction: We manually use a phoropter (the device which contains MANY combinations of lenses) to determine your eyeglass prescription. We evaluate the correlation between your vision without correction, your previous eyeglass prescription, autorefractor results and the manual refraction to make sure your final prescription "makes sense" and should be accurate and comfortable for you. Pupil, Peripheral Vision, Eye Coordination and Eye Movement Testing: These tests are helpful for evaluating eye functions and can help discover neurological conditions. Tonometry: We measure the fluid pressure inside your eyes using a Goldmann Tonometer (when you see a blue ring or dot coming toward your eyes). This is the gold-standard method to measure your eye pressure and usually preferred by patients over the "air-puff" method. You need to have some fluid pressure in your eyes to maintain eye shape stability. But you don't want too much pressure, which can cause conditions such as glaucoma. Slit Lamp Ophthalmoscopy: The slit lamp microscope has a versatile light projection system that is very maneuverable and highly adjustable, even down to a slit (thus the name). 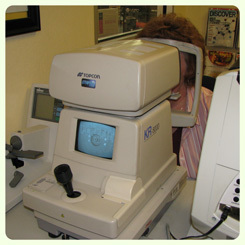 It provides a very magnified and stereoscopic view to assess the external and internal health of your eyes. The internal view is much better when your eyes are dilated. Binocular Indirect Ophthalmoscopy: The binocular indirect ophthalmoscope is the device the eye doctor puts on that looks like a miner's lamp, or a virtual-reality tool. It is used in conjunction with a precise hand-held magnifying lens to view the peripheral areas inside your eyes. This test can only be performed properly when your eyes are dilated. And More ... There are many other possible tests and procedures that may be performed during the eye exam depending on your individual needs. Eye Health Diagnosis & Treatments: We diagnose and treat many eye conditions, including dry eyes, allergies, infections, eye inflammation ... When it is beneficial for our patients, we refer patients to specialists such as cataract, retina or glaucoma doctors.